I get the most requests for Coconut Raspberry Slice at work. It’s a favourite of one of my old managers, so I make it at least once a year. This time though, it was requested by a work mate who was willing to pay for the ingredients of this and another slice of my choosing, for her colleague’s going away morning tea. I’m always looking for any excuse to try out new recipe, so if it isn’t costing me a thing, why not? Preheat oven to 190C. Line base of a 20x30cm lamington pan with baking paper. Using an electric mixer, cream butter until pale. Then gradually beat in sugar until light and fluffy. Beat in egg thoroughly. Fold in sifted flours until combined. Spread mixture onto base of prepared pan, smoothing top. 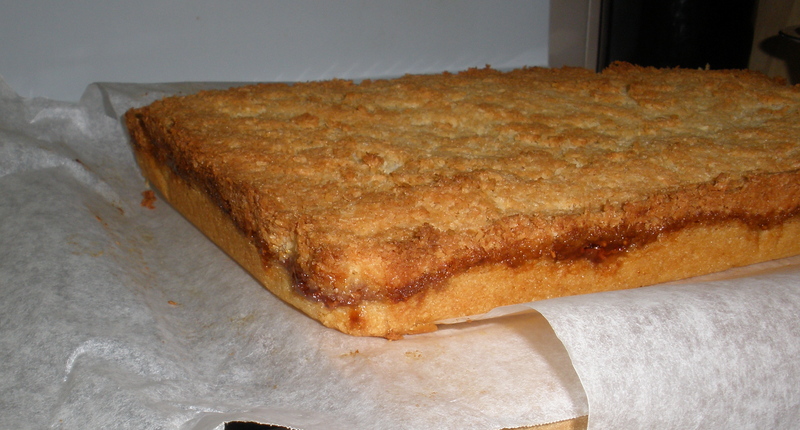 Top with a thin layer of warmed jam. Lightly whisk extra eggs. Whisk in extra sugar and coconut. Spoon coconut mixture over jam as evenly as possible. Bake for 40 minutes, or until golden brown. Set aside to cool in pan completely. Cut into squares to serve.